If you own the Assassin’s Creed®3 Season Pass, DO NOT purchase this content here as you will be charged again. Assassin’s Creed®3 game required; sold separately. Xbox LIVE free membership required. Some content may require an Xbox LIVE Gold membership to play (sold separately). 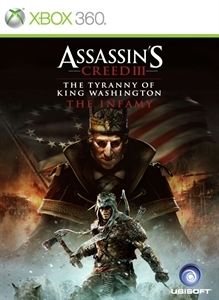 The Infamy is the first episode in the Tyranny of King Washington storyline. Following the revolution, Washington goes mad with power and rules as a tyrannical King. Connor awakes in this reality as Ratonhnhaké:ton – never having joined the Assassin order – and is greeted by his mother Kaniehtí:io, accepting a new mission to take down Washington. Acquire all-new skills to fend off this new threat to freedom. Live history as it never happened and ignite a new revolution!